Many people would agree that thechileman database is a valuable chilli pepper information resource. But whether you are growing five different peppers or fifty five, it is time consuming to have to search the database each time you want to view your varieties. 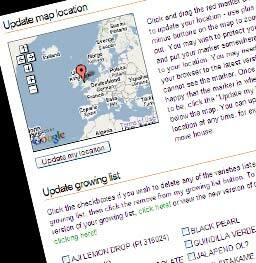 With thechileman custom growing lists you can very easily create a mini database showing just your own varieties. Add or remove varieties whenever you like to keep your list up to date. And when it comes to a new growing year, bookmark your current year so that you can look back at what you grew the previous year. You can also share your lists with friends and family. (All of the numbers above are updating in real time). Custom growing lists are currently unavailable.